Posted by starsandcars in movies. There’s somethin’ strange…in the neighborhood…who you gonna call? Yes, the Stars and Cars Blog! You can be sure that ghosts were busted in style in this 1959 Cadillac Miller-Meteor which is actually a modified hearse/ambulance– complete with flashing lights and siren! The stretched out monstrosity was piled high with a mountain of ghost-catching equipment. 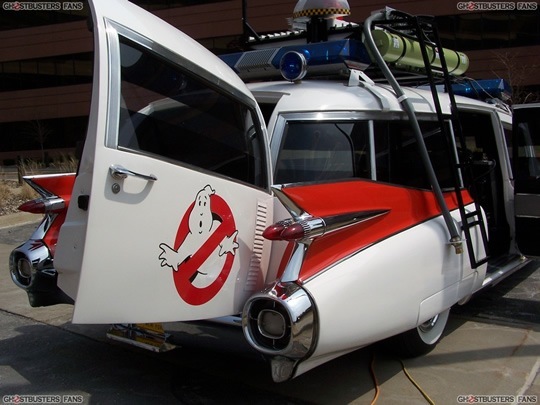 Ecto-1 was first put up for sale last year for the whopping price of $149,998 and again more recently on eBay for around $50,000! Quite a chunk of change indeed.